The right definition was there all along! Writing in the March 20 issue of JAMA, Drs. Douglas Noble and Lawrence Casalino say that supporters of Accountable Care Organizations (ACOs) are all muddled over "population health." The Disease Management Care Blog says the article is what is muddled and that the readers of JAMA deserve better. According to the authors, after the Affordable Care Act launched the Medicare Accountable Care Organizations (ACOs), their stated purpose has morphed from Health-System Ver. 2.0 controlling the chronic care costs of their assigned patients to Health System Ver. 3.0 collaboratively addressing "population health" for an entire geography. Between the here of "improving chronic care" and the there of "population health," Drs Noble and Casalino believe ACOs are going to have to confront the additional burdens of preventive care, social services, public health, housing, education, poverty and nutrition. That makes the authors wonder if the term "population health" in the context of ACOs is unclear. If so, that lack of clarity could ultimately lead naive politicians, policymakers, academics and patients to be disappointed when ACOs start reporting outcomes that are limited to chronic conditions. In short, they don't believe ACOs, as currently configured, are up to the new task. That's because ACOs would need to collaborate with social service organizations, be responsible for a geographically defined service area and improve long term public health outcomes. According to the authors' subtitle, the answer to the question "should they try" is "no." The Disease Management humbly disagrees. That's because Drs Noble and Casalino, the editors of JAMA and the manuscript's peer reviewers seem to be ignorant of the the correct definition of population health. 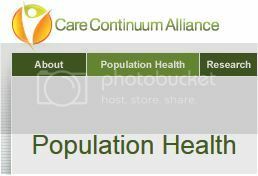 It's right there on the Care Continuum Alliance's web site, in this longstanding page that describes the "population health model of care." When the DMCB did a simple Google search on "population health definition," it had little difficulty finding the link. a delivery model characterized as a physician-guided health care delivery system designed to develop and engage informed and activated patients over time to address both illness and long term health. Accordingly, if an CMS-contracted ACO can identify its assigned Medicare population, perform needs assessments, promote awareness of health risks, offer education as well as support, increase self management, use data feedback and evaluate outcomes, it's offering "population health." By using that playbook, an ACO will capitalizing on the experience of a community of population health service providers that have been doing precisely this for over a decade. This vision is far more compact than the overreaching, misinformed and muddled definition of "population health" offered in JAMA. It is also, if ACOs invest in the right resources and partnerships, well within reach. The DMCB's answer to the question "Should they try?" is "yes."